On Sunday LJ and I hosted a clothing swap and recipe exchange. So many of our friends came and brought clothes they were never able to incorporate into their wardrobes, love but don’t wear or just want to get out of their lives. 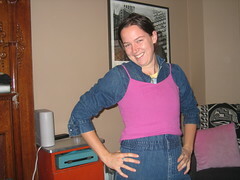 Among them was a Calvin Klein denim jumpsuit which E. said would be perfect for J. Here she is, making the outfit even more exciting with the addition of a pink tank top. This entry was posted in Fashion, Friends and tagged Uncategorized. Bookmark the permalink.